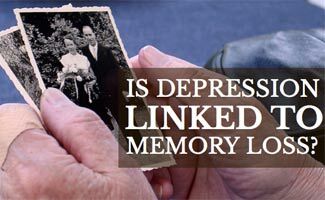 Home > Health > Mental Health > Is There A Link Between Depression and Memory Loss? Anyone who has ever experienced depression can attest to the devastation that its symptoms can bring. New research suggests, however, that memory training may serve to reduce depression symptoms. Check out this study and its findings to learn more about the correlation between the two. Also read to the bottom to find a simple and fun way to keep your memory strong. How Are Depression and Memory Linked? Experts in depression have found that individuals suffering from depression often experience trouble recalling items as well as past situations. With these memory linked skills impaired it becomes harder for the individual to focus on problem solving and instead causes them to focus on feelings of distress. Just how does depression cause a lapse in memory though? Memory is just one of the executive functions of the brain. When depression takes hold it is characterized by an imbalance of neurotransmitters in the brain. When these neurotransmitters are imbalanced, cells within the brain are unable to talk to each other as they normally would. Experts believe that this lack of communication contributes to a lapse in memory. There are a number of ways that depression affects the memory as an executive function of the brain. One of these ways is by skewing the memories that people are more able to recall. The human brain tends to recall sad events when feeling blue and happy events when feeling happy. This means that the brain of the depressed person is more apt to recall melancholy memories when in the grips of depression. This skewing of memory is often interpreted by those close to the depressed individual as being a loss of memory because they are “unable” to recall happier times. A more troublesome side effect of this selective memory recall is the effect that recalling skewed memories has on the depressed person. Being only able to recall negative memories contributes to the overall feeling of depression. A research study has focused on the effects of depression on the memory. The study endeavored to improve the ability to recall memories that are often neglected during depression. This recent study was published in the journal of Clinical Psychological Science and examined the use of a training program to improve memory for past events. The training program, called Memory Specificity Training, was implemented on a group of Afghani refugees, all of whom had lost their fathers to the Afghani war and all of whom exhibited signs of depression. The group of twenty-three adolescents was split in to a group of twelve and a group of eleven. The group of twelve took part in the memory training program where the group of eleven was considered to be the control group. Every adolescent within each study group underwent a memory test to gauge their recall ability prior to undergoing any type of memory recall training. Each subject saw eighteen different Persian words that were either positive, neutral or negative. With each word, each subject was instructed to recall a memory that was related to the word they saw. Each response given by a subject was tagged as being a specific memory or a non-specific type of memory. Specific memories are memories that pertain to a very specific event and contain plenty of detail. Non-specific memories are memories that do not bring back much detail when recalled and do not consist or event specific knowledge. All subjects in the experiment were also given questionnaires that were designed to measure symptoms of both depression and anxiety. These tests helped to scale the depression symptoms being felt by each subject in the study. For a total of five weeks, the subjects in the test group were put through an eighty minute training group each week. In this group they learned a variety of memory recall tips and also practiced them with each other. This memory training exercise also taught subjects how to identify different types of memory as well as more information about memory recall. Practicing memory recall based on cues from positive, neutral and negative keywords allowed subjects to improve upon their recall techniques. After a period of five weeks, subjects from both groups were given a memory test identical to the one given at the beginning of the study. Two months later, members of each group were also asked to retake it. The results of this research study found that individuals that took part in the memory/recall group found that they were more able to recall detailed and specific memories after their training program. It is also worth noting that these individuals also noted experiencing fewer signs of depression than those who did not undergo the training. Researchers believe that this change in memory recall can be accounted for due to changes in specific memory recall that took place over time. What Does This Study Mean for Psychology and Psychiatry? The implications of this study are quite significant, although the scientific community requires that they be duplicated as well as researched on a larger population sample. By finding that changes in specific memory recall affected how depressed patients accessed memories, these researchers were able to support a theory of treating depression without depending solely upon medication. While supplementation of memory recall therapy may be recommended in some situations, the possibilities found in memory therapy offer patients an alternative option for treatment. The team who undertook this study believe that their work will help to found future stand alone training programs that are centered on specific memory recall. By improving the ability of the brain to recall positive memories, researchers believe that they will be able to break the cycle of depression by enabling patients to focus on positive thoughts and memories. Is it possible that this type of memory recall therapy will be the answer to depression? It is not likely; however, it is one more tool in the arsenal of managing this devastating disease. While the study may be small, the idea that keeping your brain actively engaged and challenged could improve your outlook on your own intelligence and productivity seems fairly irrefutable. So, brain training on your phone or computer with brain training games like Elevate and Lumosity seems like a smart and fun way to keep yourself smiling. You can read more about these services to explore your options in our brain training review. What do you think of the study and its findings?